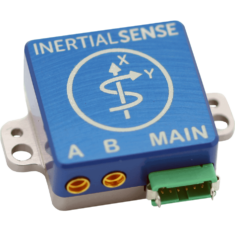 Inertial Sense have announced the release of Real-Time Kinematic (RTK) support for their Inertial Sensors. The company’s augmented inertial navigation solution is now available with an accuracy of 2-3 centimeters. This, in combination with the on-board fusion of inertial sensors, provides a robust and accurate positioning solution for unmanned aerial vehicles (UAVs) and other unmanned platforms. Inertial Sense designs and manufactures precision INS+RTK GPS sensors that deliver fast, accurate, and reliable altitude, velocity, and position for a wide range of autonomous applications. Inertial Sense’s new micro INS with RTK provides a high degree of precision for orientation and position in a compact package ever offered. Standard INS/GPS sensors offer accuracy in the range of 1.5-2 meters, with Inertial Sense’s micro INS with RTK providing accuracy of 2-3 centimeters. By optimizing the manufacturing processes for high volume applications, the micro INS with RTK sensor is literally as small and lightweight as a dime. This sensor will enable the navigation of all types of autonomous vehicles with a very high degree of precision. Inertial Sense has bundled Evaluation Kits that are simple to use and contain everything needed to get your development project logging RTK accurate data. The evaluation boards can be utilized in both Rover and Base Station configurations and include 900mhz radios with onboard logging capabilities.